Thanks for the photo. What you are describing is typical male cicada killer wasp behavior. 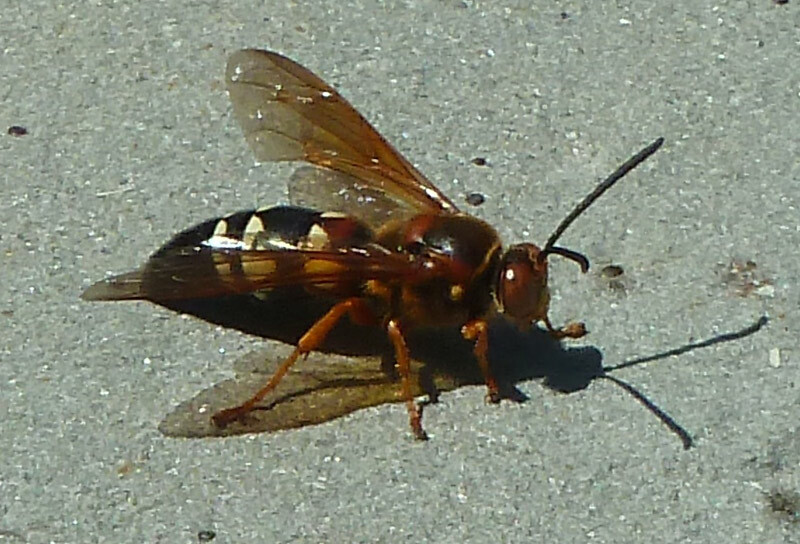 They will generally stake out a small territory and patrol it in the hopes that a female cicada killer will wonder in. At that time the trick for the male is to get the female to mate before rivals show up. While the male is patrolling, it will chase out all other male cicada killers and other insects as well. When you wonder into its territory, it will more or less investigate you but then go about its business. Cicada killer males are harmless as far as stinging goes, they have the instinct to sting but their "pseudo-stinger" is useless. My daughter found a mound of earth at my son's house by the front walkway. It scared the heck out of both of us when it crawled out of the hole and flew at us! Thanks for the comment. Yeah cicada killers, especially the females can be scarey because they are so large but they are extremely non-aggressive. I saw one on these 2 nights ago. I thought it was a moth until I saw it's stinger. It really frightened me. I was happy to locate this website. Thank you.